Together with DAAD, the German Center for Research and Innovation (GCRI) New York will host the Falling Walls Lab, a global forum for innovators to pitch their research and business ideas on September 14, 2017. Entrepreneurs, innovators, and researchers will present their ground-breaking projects, business plans, entrepreneurial and social initiatives in three-minute pitches. Are you attending the NAFSA Conference for International Educators in Los Angeles from May 29th - June 2nd? If so, be sure to stop by the Expo Hall and visit DAAD and over 50 other German institutions at the Germany Pavilion, Booth #1307. In this webinar, learn about pursuing an undergraduate degree at the University of Cologne in Germany without attending a Preparatory College first. This opportunity is available to those students with excellent German language skills who are interested in pursuing a Bachelor’s degree in Germany. The 9th German American Conference at Harvard brings together leaders from business, politics, academia and media. Taking place on April 7-9, 2017, it will inspire leadership, foster dialogue and promote innovation. From April 5th to 7th, the DAAD – German Academic Exchange Service will present “German Studies in Dialogue”, a conference which will bring more than 60 scholars from Germany, Canada and the United States together at the University of Toronto’s Munk School of Global Affairs. Chat with University Application Experts! You want to apply to a German university, but you’re not sure what steps you need to take? Then join us for this special feature! 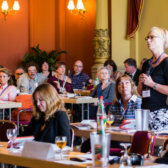 Study-in.de is holding two expert chats next week, with experts from uni-assist e.V. and from the TestDaF Institute. Click below for more details. Directed by DAAD grant holder David Clay Diaz, the film was awarded the Bavarian Culture Prize and premiered at the 66th Berlinale festival where it was nominated Best First Feature. The screening will be followed by a panel discussion with director and screenwriter David Clay Diaz and director and producer Stephan Littger. The 5th Season of the Year is Here! 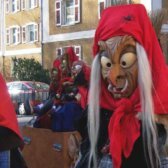 Karneval or Fasching is considered the fifth season of the year in Germany - a time to don a costume, see the parades and enjoy the political parodies. 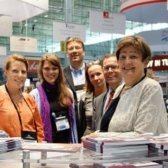 Meet "Research in Germany" representatives at the European Career Fair, Feb 25-27 in Boston, and learn about career opportunities for you in Germany! At the beginning of every year, DAAD New York hosts DAAD New Year’s Reception inviting alumni, grant holders, colleagues and friends to kick start the New Year. This year’s reception was held on January 12th and marked the opening of our award winner's art exhibition.